Native Americans have the highest pedestrian fatality risk of any racial group — and are almost five time more likely than white people to be killed while walking in the U.S.
A new study study out of University of Minnesota helps explain why: The roads around tribal lands are dangerous, offering almost no accommodation for pedestrians, even though many tribal residents rely on walking to meet their basic needs. 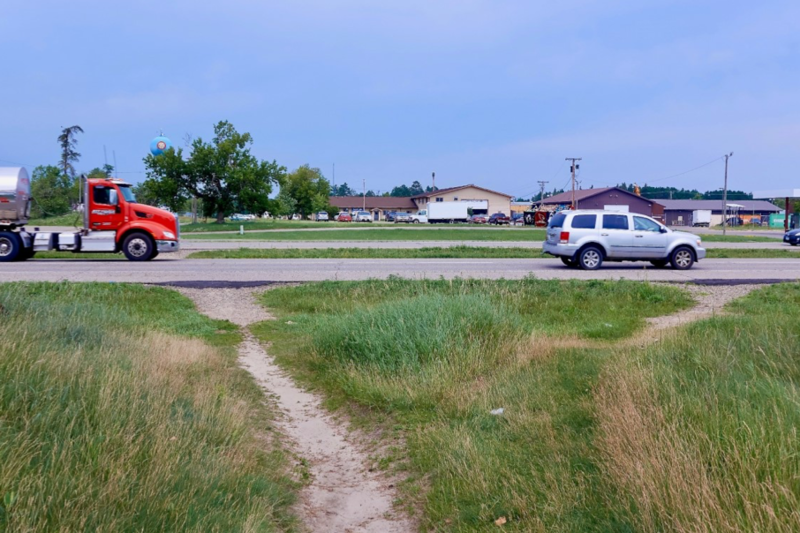 Extensive surveying and field work by Kathryn Quick and Guillermo Narvaez at four Minnesota reservations revealed that pedestrian safety was the top infrastructure concern, from tribal leaders right on down to residents and visitors. “As soon as I get on the rez I know I need to start looking out for pedestrians,” one interviewee, for example, told the research team. Residents of the Red Lake Nation in northwest Minnesota, for example, have worn foot trails along State Highway 1 toward a nearby food store. But the MN-1 is dangerous. Tribal residents walk along narrow shoulders and must navigate intersections without crosswalks or “Walk” signs. Pedestrian safety was a top concern for tribal residents, but there was a big disconnect with the way government safety officials viewed the problem, Quick and Narvaez wrote. Government safety officials interviewed for the project almost never brought up pedestrian safety, and downplayed its importance even when prompted to discuss it. Government safety officials were more likely to emphasize other issues like drunk driving or seat belt use. Quick and Narvaez concluded that more sensitive transportation planning is needed around tribal lanes including, trails and sidewalks, signalized crossings and good street lighting. The speed limit is 110 km/hr. Not sure what they expect you to do if you see pedestrians. Since 2009 there’s been in pedestrian fatalities. Mainly aimed at minority walkers. Some people go through an impressive series of gymnastics to explain this away, yet it would seem pretty clear to me that it’s not only a policy failure but more democide as well. I will never forget back in the mid-1980s when I was driving an 18-wheel truck across the Navajo reservation in northeast Arizona heading to Phoenix from Denver. It was a nice sunny day, with probably 50 miles of visibility on US 160, a 2-lane heavy truck route with narrow paved shoulders then. Probably 25 miles east of Kayenta or so here came a school bus heading east. The bus driver turned on his red lights and traffic stopped. About 20 kids got off the bus, and then the bus driver made a U-Turn and headed back to town. And looking around as far as my eyes could see there were no houses to go to, not even any hogans. I have done a fair amount of driving on Native American reservations over many years, and that day out east of Kayenta still sticks in my mind, as it was pretty obvious that life was very different there (as well as on the Sioux reservation in South Dakota) than it was just about anywhere else in America.